Uh oh! It seems Thor Slots Casino is not available in United States. Find Similar options below. 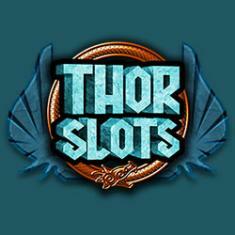 We give you an access to the latest offers from Thor Slots Casino! Thor Slots Casino is a recently established casino that strives to provide an unmatchable experience to new and existing players alike. Themed upon the Norse Mythology, this online casino is operated by Jumpman Gaming Limited and is its White Label Partner. Dream Jackpot Casino, 666 Casino, Wizard Slots Casino and Cozino Saloon Casino are the sister sites of Thor Slots Casino while together being part of the renowned Big Win affiliates. Though Thor Slots Casino doesn't support Live Casino games yet, the players can try their hands on approximately 600+ games including Slots, Roulette, Blackjack, Bingo and Poker. These games are supported by some of the most leading software providers in the industry, namely – Microgaming, Yggdrasil and NetEnt. Additionally, the players can make use of the regular bonus promotions and rewards as offered by this online casino. For starters players can get amazing prizes including up to 500 Free Spins or an Amazon Voucher as the sign up offer. Thor Slots Casino ensures to maintain utmost safety for all its real money players. This online casino works in accordance to the stringent rules and guidelines as set out by two very reputed gambling Commissions. For players residing in UK, this online casino is regulated by the UK Gambling Commission and licensed by the Alderney Gambling Control Commission for players outside of Great Britain. Any private and confidential player data is end to end encrypted by means of latest firewall and SSL services which denies access of important data to any third party sites. Thus, players can rest assured that their safety concerns are well taken care of . In this day and age it is impossible to imagine your life without a mobile device. Reason why, Thor Slots Casino has made special efforts to ensure a smooth experience for players accessing the casino website on the go. As a front runner in the online gaming world, Thor Slots Casino ensures to port all its games to mobile devices so that they run seamlessly on hand held devices operated by Windows, iOS and Android systems. Mobile Gaming has indeed revolutionized the future of online gaming. The entire Thor Slots Casino website is visible on your phone's tablet's browser easily. Thor Slots Casino, displays the entire catalog of games as available on the desktop version at a single tap of your finger. Thus, you can play a variety of slots, table games and bingo games as per your convenience on the go or from the comforts of your home! Casino ensures to port all its games to mobile devices so that they run seamlessly on hand held devices operated by Windows, iOS and Android systems. Thor Slots Casino features multiple games provided by some of the most renowned software providers in the industry. These games support stunning graphics, innovative characteristics and high quality content thus providing this online casino with an edge over other casinos. The long list of software providers are recipients of many industry awards and are names synonymous with rendering best in class services online. Home to numerous online slots and card games, the casino has games backed by the following software companies – Microgaming, NetEnt, Big Time Gaming, Eyecon, Triple Edge Studios and Yggdrasil among others. These leading industry providers ensure to enhance the game play experience of a player. support stunning graphics, innovative characteristics and high quality content thus providing this online casino with an edge over other casinos. The long list of software providers are recipients of many industry awards and are names synonymous with rendering best in class services online. Always at the forefront in terms of its gaming collection, Thor Slots Casino houses around 600+ slots games including plenty of other table games to keep the players engrossed at all times. This online casino's gaming section has been segregated into various sections that include 'Hot Slots', 'My Faves', 'Newest' additions, 'Jackpots' and finally all games listed in alphabetical order which makes all the games easily accessible. This segregation also helps the player locate their preferred games quickly. Accommodating players with varied choices and budgets, the slot games here offer significant pay outs as well as fun and excitement galore. With the slots line up at this online casino, you'd realize that you're spoilt for choice owing to the extensive slot games. All of which have been powered by industry leading software providers, namely – Microgaming, NetEnt and Big Time Gaming etc. The most popular slot games can be found under the heading – 'Hot Slots' and includes games like – Starburst, The Great Albini, Book of OZ, Aloha Cluster Pays, Bonanza. There are other slots games as well, namely –Gonzo's Quest, Berryburst, Immortal Romance and Reel Talent. The Jackpot Games at this online casino consist of some of the most rewarding jackpots. The selection of games here also includes progressive slots that continue to grow until the jackpot is triggered! Hence spin the reels of any of the progressive or regular jackpots to win and eventually fulfill your dream of becoming a millionaire with just a single click. This section consists of games like – Mega Moolah, Homes and The Stolen Stone, Stampede Jackpot, Past the Post Jackpot, Temple of Iris Jackpot, etc. If slots aren't your thing and table games appeal more to you then Thor Slots Casino has got you covered. This online casino houses a decent variety of table and card games that includes variants of Roulette, Blackjack and Poker. Although the table games could use a few more additions to this specific games section, but if you're looking to test your skills then these games bring about a different variety as compared to the all time favourite slots. Games like Blackjack, European Roulette, Euro Roulette along with multiple poker variants find a place here. If you're not into the hype that surrounds slot games, then this online casino gives you an array of opportunities to win real money online. Of these one of the games that might peak your interest are online Bingo Games. Thor Slots Casino houses 90 Ball Bingo games that are easy and fun to play. All you are required to do is pick a room and unleash oodles of fun. What's more, some of the rooms might also include Progressive Jackpots! The collection of games here consists of – Lucky Stars, VIP Free Bingo, Fair & Square Bingo. New Players at Thor Slots Casino are up for a pleasant start where upon a successful first deposit, players receive a chance to spin the Mega Reel once for free! This free spin on the Mega Reel can award you random prizes that range from Amazon vouchers to free spins on some of the most popular games. However, this offer is not available when depositing through the Quick Deposit option. Additionally, the free spins are only available on selected few slots as chosen by the casino itself. So, should you reach the ultimate VIP level that is VIP, you can receive up to 20% Cashback on any lost deposits. Wouldn't it be incredible if you could receive something extra every time you deposit on this online casino? Well your prayers have been answered! You can now unlock the Turbo Reel with a minimum deposit of £100 to win some fantastic prizes where all the winning segments have been elevated to 50 or 500 Free Spins! The free spins are awarded on games as decided by the casino. So get your hands on some incredible slot games without any extra cost! A perfect week doesn't need to be anything fancy but just a pizza can give the necessary kick required to start your week on a high and to top that what if the pizza is delivered for free? However, there's a catch! This offer is only available to the Thor Slots Casino VIPs. If you're a part of the Exclusive Club at this online casino then you'll be entitled to receive a free pizza coupon every Monday! All you need to do is play your favourite slots on Sunday where 5 VIP players scoring the highest wagers will be emailed a £15 Pizza Express e-voucher. Whoever coined the term Monday Blues certainly never played on Thor Slots Casino! Don't miss the incredible Happy Hours at Thor Slots Casino that are no longer limited to just one hour but instead start from 3 pm every Wednesday and continue up until 7:00 in the evening. Up for grabs are 10+ Free Spins on different slots every week available for all the funded players. To claim your share of the free spins, simply login to your account every Wednesday during the promotional period and your Mega Reel spin will automatically be credited. Indeed, happy hours done right! Who would've thought that collecting trophies could fetch you more than just appreciation. At Thor Slots Casino, you get a chance to win a £10 Amazon Voucher for free for every 200 trophies collected. What's more, players can also claim up to 500 Free Spins for every 5 trophies they collect, that's a whopping 20,000 free spins in totality! If you're wondering how to earn these trophies then login to your account and visit the Trophies page to see the multiple ways listed on how to earn new Trophies! The VIP Scheme at this online casino believes in appropriately rewarding their most loyal players. The VIP program at Thor Slots Casino consists of 16 tiers, wherein higher the level better shall the rewards be. Upon attaining 5 trophies a player can move up one level that entitles them to receive bonus offers and promotions in accordance to the VIP level. Furthermore, each time you reach the next level, you receive a free spin on the Mega Reel. In order to collect the trophies, all you need to do is complete the challenging and entertaining tasks as visible under the dedicated 'Trophies' section in your Thor Slots Casino account. Time and again, this online casino keeps offering new and existing players with lucrative offers that include free spins, gift vouchers and no deposit bonuses! To claim your share, all you need to do is keep a regular tab at the promotions lobby or your registered email address where all the offers that you're eligible for will be displayed. There is nothing I dont love about this casino. Been a long time since iv been playing here. Amazing bonuses, promotions and what not. Out of the collection of 600, I love playing the popular ones including starburst, gonzo's quest, so I am sure other players will also like something they like. Coming to promotions, I have only claimed the sign up offer where I won free spins on the popular slot. Easy and quick withdrawals, amazing look of the website! Only thing I want now is be the next Mega Moolah winner here hahah. Overall a must try for all the players looking for a good trusted casino. Please enter your review for the Thor Slots Casino.